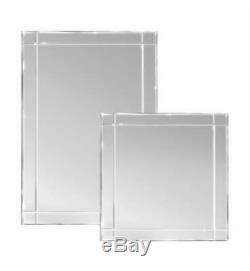 Aptations 16 Frameless Square Fog Free Shower Wall Mirror, 60016. The ClearMirror Frameless Square Fog Free Wall Shower Mirror is the perfect amenity for your master bath design. The luxurious look of the mirror set flush with the tile will definitely add to the sense of style you are trying to achieve in a bath renovation. 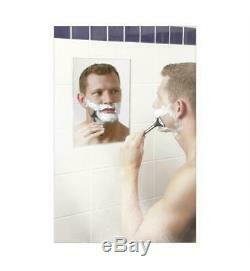 Luxury and convenience heated fog free shower mirrors add style and functionality to daily routines for men and women. Heated fog free shower clear mirror installs flush with the tile for a seamless luxurious look. Mirror Features: Fog Free, Magnifying. During our time in business, we have established favorable business relationships with many factories that meet the highest industry recognized standards at favorable and/or discounted prices. By continuously broadening the business scope and scale through rigorous efforts, we will continue to offer many more wholesale priced products, thus broadening the variety that our customers demand. By providing competitive price on luxury goods and perfecting our trade service, we sincerely hope to develop trade and economic cooperation together with more and more customers from home and abroad. How Do We Offer Discounted Bathroom Supplies? We carefully watch our spending, utilize every opportunity to save on costs without sacrificing quality or customer service, and use a business model that is dictated by volume over margin. This means that even though we make much less profit on every home or bathroom item that we sell compared to others in the field, DecorPlanet makes up the difference by having an ever growing loyal customer base. In rare instances, there may be an extenuating or unforeseen circumstance that leads to a fulfillment delay. In such instances, our customer service department will keep you updated on the order status. Select Toto, Fleurco and Danze brand products. DEPOSITS DecorPlanet requires a 50% deposit on all merchandise. PLEASE FOLLOW THE INSPECTION INSTRUCTIONS BELOW. Inspecting and receiving your Merchandise Please inspect your package carefully when it arrives and note the condition of the box. Unfortunately, after 48 hours we will not be able to file a claim due to the carrier's claim restrictions. After 48 hours, it is assumed that all merchandise was received in good condition and you will be responsible for the cost of the replacement item/items. After 10 days, you will be responsible for the cost of replacement. If the merchandise has been installed, we will not be able to file a claim or provide a replacement. / How can I track my order? The'My Account' customer portal provides a wide-range of useful information and resources. Please check the'My Account' customer portal (see Answer #1) for updates. What else should I look out for? Serving the NY-NJ-CT-PA metropolitan area. Remember, deliveries are curbside only, so recruit your contractor or friends to help you bring the goods inside the home. Proper inspection is a critical component to DecorPlanet being able to provide you with a no-cost replacement of goods damaged in transit. What should I do if the driver will not allow me to inspect merchandise? You may also contact customer service. Merchandise was just left at my door. This is never done at the request of DecorPlanet. In the event this is your experience, please inspect the merchandise immediately and take photos of any damage. Is there a way to expedite my order? I want the items to be brought inside my home, do you offer white glove service? Please contact our customer service department for availability and a quote. What information do I need to submit? Replacement orders are typically sent out within 24 hours of confirmation of noted damage on the Bill of Lading. How can I get a replacement or have the issue resolved? No two stones are the same Tiles that are not in original packaging and not FULL boxes Washlets, toilet seats and bidets. After 48 hours, it is assumed that your order arrived in perfect condition and that all of the correct items were received. If you are planning to install or use the merchandise at a later time, please inspect the item/s within 48 hours and store it safely away. Products that cannot be canceled Floor Samples, Discontinued, Final sale or Clearance items Products that are marked as non-returnable and or/non-cancelable on your receipt, Custom/Special Order Merchandise or merchandise made to order or Fabrication. Please refer to order cancellation section above. This listing is currently undergoing maintenance, we apologize for any inconvenience caused. The item "Aptations 16 Frameless Square Fog Free Shower Wall Mirror, 60016" is in sale since Monday, April 2, 2018. This item is in the category "Home & Garden\Home Décor\Mirrors". The seller is "decoreplanet" and is located in United States. This item can be shipped to United States.